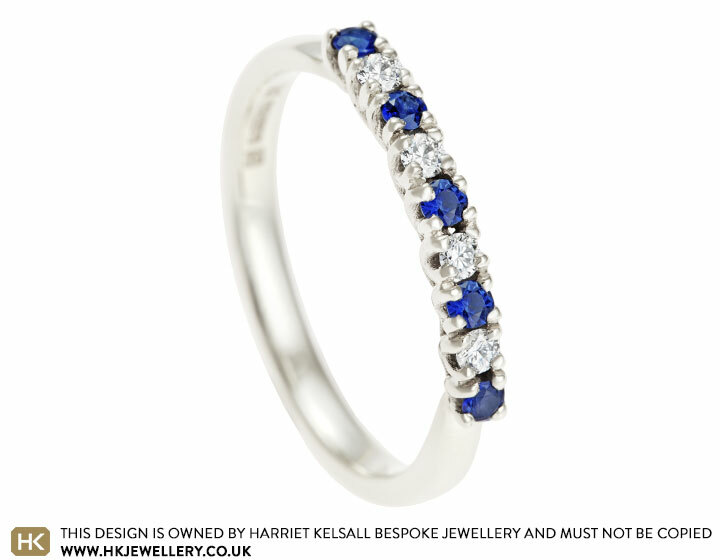 Crafted using Fairtrade 9 carat white gold, this unique eternity ring holds nine 2mm brilliant cut gemstones; four diamonds and five cornflower blue sapphires. The diamonds are G-H in colour and Si 1-2 in clarity with a total weight of 0.14ct. The striking sapphires have a total weight of 0.17ct. The design features delicate crossover style claw settings which sweep in between each gemstone, while the warm tones of the Fairtrade 9 carat white gold complement the icy white and blue gemstones. The band is 2.2mm wide and has a courting profile and a polished finish.